Dalkeith Plastics Pty Ltd can carry out all your testing requirements for non-destruction/destruction tests of sample welds. We supply comprehensive written reports for all tests. 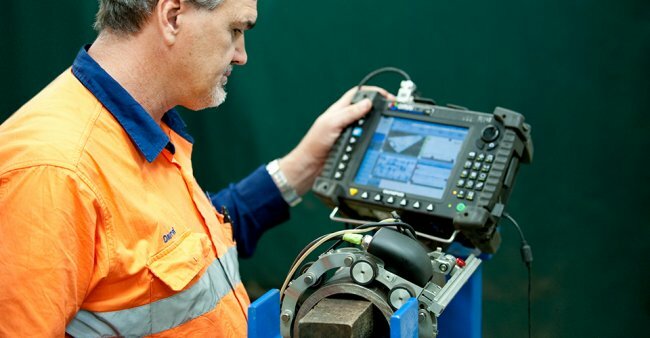 From a sample piece of a weld Dalkeith Plastics Pty Ltd can produce a “coupon” that can be exposed to a hydraulic test unit which then can be inspected and compared to a reference chart to determine whether a successful weld procedure has been used. From a sample piece of a weld Dalkeith Plastics Pty Ltd can arrange to destructively test the breaking properties of the weld to determine if it is acceptable in regards to HDPE properties. Dalkeith Plastics Pty Ltd can arrange to have welds or HDPE materials tested using “Phased Array” technology to determine if there are any inconsistencies in the material or fittings. Dalkeith Plastics Pty Ltd can perform a closed system test that requires water to be held for a period of time above the “working pressure” of the pipe. The “working pressure” is determined by the intended application of the pipe, therefore varies with each intended application.